행운의 6이 나와서 135스팀 환급!!!! 전 200스팀은 날라가고 토큰은 250만개..
매크로를... ㅎㅎㅎㅎㅎ 저는 1씩 배팅해서 채굴을 많이 못했습니다. 이제 겨우 80만 넘었네요. ㅠㅠ 60스팀 정도 쓴 것 같아요. 저는 간떨려서 못하겠던데 본전 찾으셨다니 다행이네요! 마음을 비우고 버린다고 생각하지않고서는 힘이들어요. 다이스게임은 하면 할 수록 도저히 못 따는 게임이 맞는 것 같습니다. 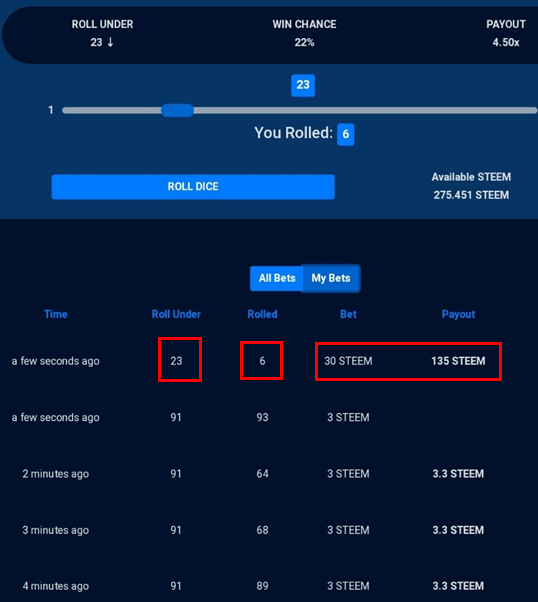 Your UA account score is currently 3.785 which ranks you at #4942 across all Steem accounts. Your rank has improved 1 places in the last three days (old rank 4943). In our last Algorithmic Curation Round, consisting of 192 contributions, your post is ranked at #65.